Composed in austere colours of red, orange and saffron, the spiritual journey of Minh Long's monks is a portrait of dedication, discipline and meditative progression. Almost ephemeral in their being, the monks seem to transcend mortality into symbols of spirituality, forever moving in their collective isolation from society in a state of enlightened bliss. I'm looking for an artwork similar to Together Spiritual journey 1 by Minh Long. Thank you. 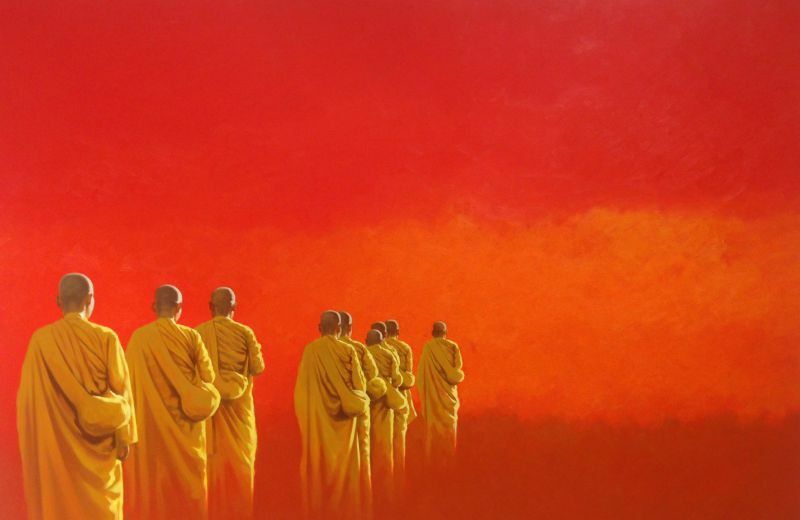 Minh Long's art reflects the simplicity of Buddhism, which is the most identifiable theme in his painting. This simplicity is contrasted with his colour palettes of light yellow, grey and brown which are mixed to reflect life's sophistication. In his pieces, mendicants or monks recede into infinity; lotus leaves are displayed in their purest form and bells toll; evoking tranquility and bliss - emotions that speak to the soul. The art of Minh Long is sincere, a far cry from 'fashionable art' that is found in the current market. With generous and quick brush strokes, he aims to elevate his audiences to a deeper understanding and perception of life. ML's works is not on a large scale as entertainment paintings. ML's art is a selection of quintessence of Buddhism which is simple but mysterious. 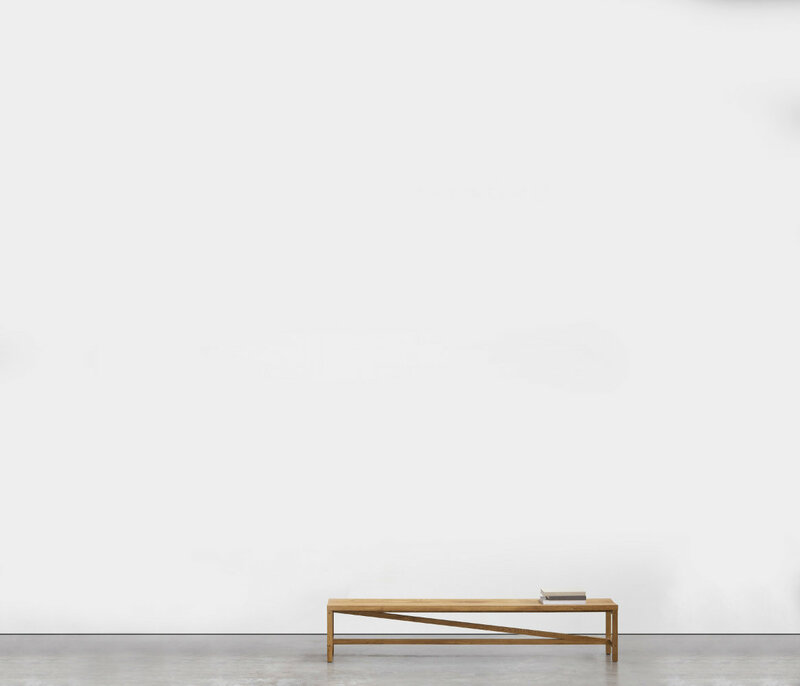 Therefore, ML's paintings have drawn a lot of attention from collectors in recent years. ML's paintings are neither fussy to make audience difficult to understand nor seducible by tricks of oil- painting. His paintings usually bring to calm and tranquil feelings. Visiting the gallery which is not so crowded or colorful like other types of paintings, audience are attracted by ML's art where they can find a deep feeling and all of their worry is released thanks to the soul and the philosophy of the true, the good and the beauty in ML's art like a binding string between reality and consciousness. As long as people are obsessed by their biological needs, they still indulge in ML's art to return to candour. ML's art is a simplicity of Buddhism which is the most identified characteristic in painting. We all know that painting is an artistic science of dimension and colour. In other words, through colour, layout and dimension, a painting will influence people's mind and bring them an aesthetic sense. So dimension is a key factor to which artists have to pay attention during creating. Moreover, the requirement to dimension in Buddhism art is more strict and sensitive because religion is a philosophy form to explain the world in terms of spirit. It is this factor which has great impact on ML's art, high symbolic and meaningful of mystery. Color palettes like light yellow, grey and brown mixing up to describe the life's sophistication. Some mendicants or monks are receding to infinity. The purity of lotus leaves as well as solemn reddish yellow parasols and the bell ringing are all awaking human beings. All create a gentle symphony bringing people to bliss. These true emotions raise the works out of normal sense to reach noble and pure enjoyment in one's soul. In a slow and careful approach, the artist does not paint too much like others. Beyond the market attraction to return to the sincerity as well as his contrary trend towards fashionable art commonly found in the current economic market, ML's art has directed him in a new path with his liberal but efficient brushstrokes to bring up audience to a higher level of life's understanding. Minh Long Critic Nguyen Hung on Minh Long Vietnamese art has been influenced by both Oriental and Western art and Minh Long's art is an illustration. Every artist has his own light. It was scientific in the Renaissance and in Minh Long, it is religious and natural. Ethereal light in ML is appeared in calmly flying clouds, looming yellow - brown - red lap of dress and sound from nothingness. Monks are silently walking to a state of bliss. It reflects an inspiration of self-reconcilement in every one which ML is searching in his way, some innocent nature in mind, some influenced by Oriental humanistic philosophy. Minh Long said:"Neither among a monk, a bell nor a prayerbook could help release anyone. Nevertheless, it shows an inspiration to true heart." Yellow and brown reflect the color of sky and ground, mercy in a diversified life. I think that Minh Long's inspiration is acceptable because of the echo of the bell, the self-reconcilement, which can not be ignored to be grown-up. Minh Long's art has an impressive style, reduction in language and usage of palette. His paintings make viewers out of the normal life. He might be influenced by impressive Western style in his fading and soothing unreal air although his palette is oriental mild, mainly in light brown - apricot yellow - red - milky white, sometimes green spots on monks' bags to emphasize the passion and hope. In Minh Long's art, there are only monks' journey to nothingness, bell and purity of lotus, background as flying clouds. By skillful processing, he has created unreal air with drifting and bobbing clouds, non-temporal and mind's light, relating to past's images as well as future's. A simple beauty with religious-minded for all the times. Ming Long's art is oriental aesthetic, simple but sophisticated, dreaming but emotional. Viewing Minh Long's art makes us realize the relationship between the artist and Buddhistic philosophy. His paintings are filled with monks, brown red umbrellas, bells in smoky air. Despite any strict viewers, they would certainly be directed to tranquility. Coming back to real life, we are burdened by workload and upheaval of worries and concerns: greed-hatred-anger-affection. Should we have chance to view Ming Long's paintings, we will get back soon to tranquility. No concern and back to true heart. Monks' journey either for food or on missionary will bring viewers to a state of bliss and forget all the troubles. People's mind is subject to the context. That's the way Minh Long intends to help others by bringing them back to the gentle spirit. Eyes in man's heart. Any tragedy comes from leaving Heart for Materials. Coming back to true heart, the Oriental philosophy, is a call from the nothingness. The call comes from Minh Long's art, a combination between heart and cloud. I hope that it's not only Minh Long's inspiration, a mind's journey, but of everyone as well.